(Boise) – The Goose Rapids Fire held in place overnight. A better acreage estimate of 600 acres was observed via aircraft fly-over today. Resources continue to be engaged in structure protection operations including a type three (3) incident team, and an additional hand crew was added. Evacuations remain in effect for residences along Idaho side of Snake River, from Corral Creek to Dough Creek per the Nez Perce County Sheriff. Zaza Road is closed at Deer Creek Road and Zaza Road Intersection. Idaho Department of Lands (IDL) together with the U.S. Forest Service, the Clearwater-Potlatch Timber Protective Association (CPTPA) and the Nez Perce County Emergency Management Services, continue to battle the fire that started 21 miles south of Lewiston near Wild Goose Rapids on the Snake River, approximately 1 mile north of China Garden Creek in Nez Perce County. Critical fire weather conditions are expected again today. Very hot temperatures in the 90’s to 100s and red flag warnings are in effect until 8 p.m., with sustaining west winds of 10-20 mph. Seven engines, two bulldozers, two hand crews are on scene. Approximately ten aircraft including one Air Attack, three helicopters, two Single Engine Air Tankers (SEATs), and four large air tankers will continue suppression of the fire and logistically support the ground resources. 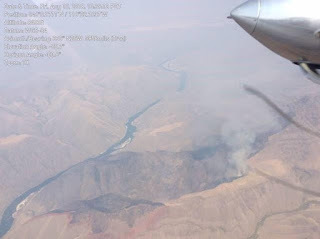 Stage 1 Fire Restrictions continue to be in effect for this portion of the River Breaks which prohibits the building of any campfires outside of a permanent agency owned fire structure as well as smoking. Smoking is prohibited except within an enclosed vehicle, building or designated recreation site, or while stopped in an area at least three feet in diameter that is barren or cleared of all flammable materials.